We get lots of press releases in our email and typically we don't use them, but earlier this week we received one that was of great interest to us since I (and many of our readers' kitties) have asthma. I can say with 100% honesty that I have never blown into a breathalyzer to have my blood alcohol level checked, but our feline friends may soon be using similar technology for earlier detection of a common and sometimes deadly feline respiratory problem – asthma. Asthma affects nearly 5 percent of domestic cats and can be difficult to diagnose, resulting in treatment delays that can worsen symptoms. 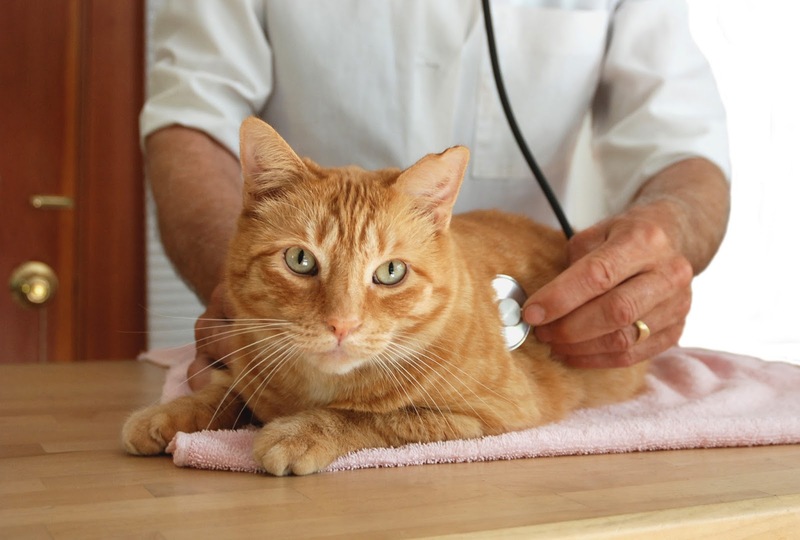 Now, studies on a new, non-invasive diagnostic test suggest the test may one day help veterinarians identify and treat asthma in cats earlier – potentially meaning fewer acute asthmatic attacks and improved lung health for cats in the long term. University of Missouri researchers, funded with a grant from Morris Animal Foundation, examined biomarkers in "exhaled breath condensate". EBC is collected by exhaling into a cooling device, which causes the moisture in the breath to condense into droplets of liquid. In humans, for example, breath alcohol concentration, or BrAC, is one type of EBC-based test. The research team collected condensate from cats with signs of asthma and compared it to condensate from cats without asthma. The team found components that differed between the two types of samples, and that may be promising biomarkers to help identify cats with asthma. Coughing and increased breathing effort are the two most common signs of asthma in cats. However, some cats show no clinical signs until they have an asthmatic crisis. Many other diseases, such as heartworm disease, lungworm infection and chronic bronchitis can have similar signs. Because each disease is treated differently, making an accurate diagnosis is important. Left untreated, asthma is not only distressing for a pet cat but can cause permanent damage to the lungs. “Having a non-invasive means of diagnosing asthma early in the course of disease will allow proper targeted therapy that can prevent declines in lung function over time,” said Dr. Reinero. To build on their research findings, Dr. Reinero and her team developed a panel of biomarkers to validate their findings in more cats with and without naturally occurring asthma. If successfully validated, the panel could become an early diagnostic tool to help veterinarians identify and treat cats with asthma before they develop serious lung problems or suffer from an acute asthma attack. We do not have asthma, but our Mom does. We know how bad she gets and can not imagine how terrible it is for a cat! Glad they are coming up with new ways of diagnosing. That is fascinating! I love the Morris Animal Foundation. They do such good work. Asthma is a tricky disease because it looks like other diseases on x-rays and ultrasounds, like pneumonia and lungworm. I hope this new test will help vets diagnose asthma more easily. That is really interesting, and I hope this new test can help a lot of cats. Thanks for sharing! This sounds so promising, and I really hope it can be put to use soon. That would be so wonderful for so many kitties. None of my kitties have been diagnosed with asthma, but I myself was diagnosed with it years ago. It can be a scary thing, and I feel so bad for kitties who simply can't tell us how they're feeling. I am so glad to hear of this new discovery and development. Thank you for sharing this news with us, Mudpie and Melissa! We read about this test too. It sounds very promising and we hope it can help kitties with asthma like you, Mudpie. The Morris Animal Foundation does amazing things, this sounds like a great test. Wow, this is wonderful! Thank you for passing this along. Hmmmm, my asthma is diagnosed without any xrays or tests. Last year they were finally able to x-ray me to get a definitive diagnosis. If you saw how I struggle when TW brings the AeroKat near me, you'd know I'm not gonna breathe into anything. Heh. I'm sure it will help other cats though. Wow, this is really neat! We hope this new diagnosis system proves to be effective and put into use!